Please note: Cruise West has ceased operations. On board a cruise ship, bigger is not necessarily better. A small ship cruise is an experience definitely worth trying. A limited number of guests provides an up close, casual and personal ambience. The small size, like the Pacific Explorer of the Cruise West company creates an inviting neighborhood atmosphere. On a boutique cruise boat, one has to trade fancy ballrooms for nimble Zodiacs (small inflatable boats) and glitzy entertainment for tours of preserved territories led by locally born naturalists. These guides expose the wonders of nature that our urban eyes do not fully appreciate. The ship's small draught allows access to the shallow waters of remote destinations that are off limits for larger carriers. Travelers will often be the sole human presence on a tiny islet or under the canopy of an otherwise out-of-reach rain forest. This is ecotourism: Approach nature and watch it, but don't touch it. Don't trample upon the plants or animals in any of these areas—even the trail of modest leaf-cutting ants that are smart enough to set up a precise and effective social organization. If we place it in parallel with the chaos and on-going disorder of the human world, the observation of the clockwork functioning of a society of insects poses a serious question about us. A walk in the jungle with the three Costa Rican naturalists on board—Marco Soto, Miguel Alfaro and Alejandro Lopez Espinoza—can be an enlightening moment. The Pacific Explorer is equipped with indoor lounges and one outdoor, as well as a dining room. Lots of outdoor space and no-frill staterooms—but all you need is there—create a casual background. The dress code is reflective of the laid-back setting as shorts and polo shirts are acceptable if not de rigueur. Fifty cabins can accommodate 100 guests maximum. All cabins have picture windows and teak beds. Moving at a speed of 12 knots per hour, the Pacific Explorer compensates for its lack of luxury through attention to detail. Every day, cabin towels and dining room napkins are fashioned into different animal and flower shapes. The crew bends over backwards to please guests without even expecting a tip. The Chef takes advantage of local ingredients, fresh fish, vegetables and fruits to create healthy dishes and aesthetic presentation. Wines are well-chosen and affordable. The pastry chef turns out tempting sweets, however, don’t miss out on the abundance of fresh fruit offered at all times. The ship begins its journey at the Pacific Coast from Los Suenos, a luxury resort where flamboyant yachts of billionaires are anchored—just 150 kilometers west of the capital of Costa Rica, San Jose. The Pacific Explorer dawdles along the Costa Rican coast with relaxing stopovers at coves bordered by beaches to dream about. The Parks are easily accessible, as is Manuel Antonio National Park, by the Zodiacs (the inflatable boats accessed from the stern of the Pacific Explorer) that whisk guests to the sandy shore. Manuel Antonio is popular because it is easy to get to from San Jose, thus can be relatively crowded. The park is well-maintained and boasts an abundance of wildlife found in the rainforest, including iguanas, lizards, white-faced capuchin monkeys, sloths and tapirs. 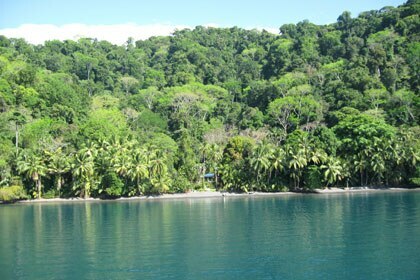 The next day, on the shores of the Osa Peninsula, we dive into the thick of a 100,000-acre sanctuary called the Corcovado National Park. Here, a host of wildlife proliferates in the humidity procured by enormous rainfalls, totaling 20 feet per year. It is home to scarlet macaws, six species of monkeys and elusive jaguars. Huge Ficus trees draped with lianas shelter epiphytes like orchids that, in exchange, avoid becoming a parasite to their host. Other trees hoist themselves up to reach more light and build roots above the ground like buttresses. 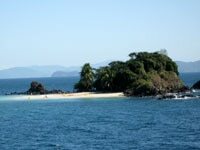 In the Panamanian waters coralline atoll Granito de Oro—the best snorkeling opportunity—faces the Island of Coiba, a former penitentiary and now a national park. Across the gulf of Panama lies the deep Darrien jungle and its immense National Park, home of the friendly Emberà and Wounaan Indians. Some of them appear on the black sands of Playa de Muerto in their traditional attire to perform native dances and sell artifacts including fine baskets, tagua (a palm nut) small carvings of animals. Although this visit is a tad reminiscent of a staged Disneyland set-up, it is fascinating to watch an endangered human race and their determination to save their existence from the violence of our civilization. The 50 miles of the Panama Canal opens the Atlantic into the Pacific. It's an extraordinary achievement initiated by the French and completed by the Americans in 1914. The operation is an unforgettable experience to witness, first-hand, at eye level, the gigantic ships passing through a narrow canal to be lifted up into the mountains and back down again. 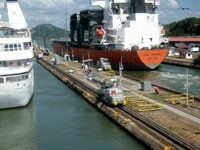 From sea level the canal's three sets of locks elevate ships to Gatun Lake—located 26 meters above sea level—and then back down again to sea level on the opposite side. These double locks act as aquatic elevators, allowing ships to raise and lower as water levels rise within a lock. As you watch the bewildering spectacle of locks of the Panama Canal, raising huge container ships in the mountains, one wonders what mankind will be able to accomplish if it does not destroy itself first. The place is in ruins. 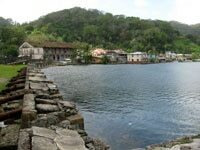 It's hard to imagine the past splendor of Portobelo (The beautiful Port) in the days of the Spanish conquest when the King's frigates were loaded with the gold of the Incas and the pirates raided the port and ambushed the precious convoys. 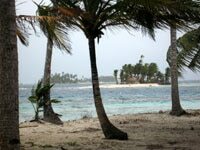 The San Blas Archipelago contains over 365 tropical islands that are home to the Kuna Indians. 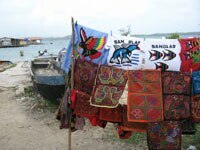 Located barely above sea level, these islands are famous for their "molas"—exquisitely hand stitched multilayered panels in an assortment of colors depicting animals, flowers or abstract patterns. As the indigenous community of the area, the Kunas run 40 of the islands as an autonomous republic and treat any foreigners accordingly. Considering what happened to their ancestors, they probably have good reason to act as such. Another subject to arouse our meditation. After disembarking in Colon, we are left not only with unforgettable images, but even more precious, with food for our brain. For more information on Cruise West call 800-296-8307 or visit www.cruisewest.com. 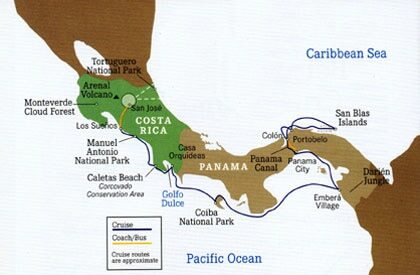 Panama was visited by both Columbus, on his last trip, and Balboa, the first European to see the Pacific, in the 16th century, which started 300 years of Spanish rule. Panama City became central to the European's explorations and conquests of both continents. The war-torn 19th century saw the pivotal land break from Spain and become part of Columbia, but even though independence was declared in 1903 with the help of U.S. forces (who invaded in 1989 to oust "President for Life" General Manuel Noriega), it wasn't until 1999 that the Americans returned the stewardship of the Canal Zone to the locals. Today, with a population of 3.3 million, the country has the fastest-growing economy in Central America, and is the largest per capita consumer. Much of the economy is service-based due to the country’s unique location, concentrating in banking, commerce, trading and tourism. Panama also contains the largest free-trade zone in the Western Hemisphere, the Colón Free Trade Zone, and exports coffee as well as other agricultural products. As its name given by Colomb in 1502 indicates, Costa Rica (The Rich Coast) has today, but only today, acquired one of the highest standards of living of Latin America as a result of its stability rather than of its natural riches. When they found out that contrary to what Colomb thought, there were no riches, no gold, no minerals the Spaniards disdained the deceivingly dubbed land in favor of neighboring Nicaragua. After the independence from Spain, in 1821 it was the assiduity and the ingenuity of the Costa Ricans who call themselves the Ticos that brought prosperity. The priming factor was the development of the coffee plantations cultivated by a middle class that has been the vector of a real democracy in Costa Rica. No war, no guerilla, no coup d’état, Costa Rica is a model of democracy and peace incarnated by its former President Oscar Arias laureate of the Nobel Peace prize for the role he played in defusing the conflicts of Central America. Agriculture is strong with its quality mountain coffee, bananas, tropical fruits and flowers that are no longer a monopoly of the infamous United Fruit Company. An industry is emerging, producing textiles, medical equipment and less expectedly: microchips. The mountains of Costa Rica have lost 70 percent of their forests, but the government has taken measures to halt the chainsaw massacre and implemented a policy of sustainable development to preserve the flora and the fauna. Costa Rica is still host to more than 10,000 varieties of plants among which 1,100 species of orchids, 850 species of birds, 7 varieties of sea turtles and animals such as sloths, monkeys, tapirs, ocelots, and jaguars. 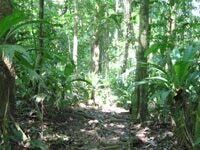 To halt the deforestation and the devastation Costa Rican authorities who believe in the virtues of ecotourism (and of its profitability) have created a number of National Parks where the plants and the animals are at least to some extent protected from the poachers. The 4 million Ticos, mostly Meztisos (Spanish Indians), enjoy the benefits of a social organization that takes care of their education and their health that lures the neighbors (Nicaragua & Panama) in quest of a better life. Most of the Ticos whose daily diet is revolving around rice and beans live in the Central Valley—la Meseta—where the capital San Jose is nestled between the Cordilleras (mountain ridges) at the foot of the Poas and Irazu volcanoes. Its 2,998-foot elevation cools down the tropical heat and delivers a pleasant year-round climate to San José, but also imprints a mountainous austere touch. The core of a quick visit to San Jose can be contained in a perimeter around the Plaza de la Cultura where the Teatro Nacional and its elegant classical architecture, the Museo de Oro Precolombino, the Museo de Jade that boasts an exceptional collection of jade, are located.